Wrote over the sentiment with the Pico IrRESISTible Embellisher to give it a nice glossy finish without the hassle of embossing. Inked up the hearts from Essentials by Ellen by Julie All Inside with a pale pink #723 Tombow marker onto an A2 card made from Canson watercolor paper and then painted over with water. Rubbed a Ranger Distress Marker (Festive Berries) onto a palette and watercolored over the hearts to provide some dimension. 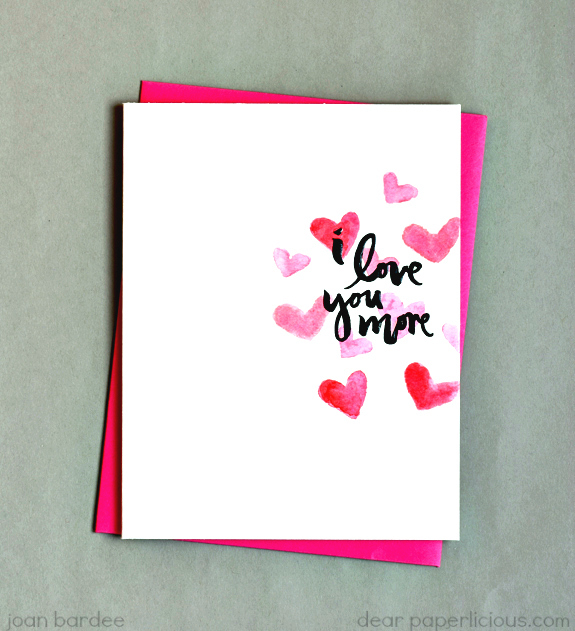 Let card dry and wrote over the sentiment with Irresistible Pico Embellisher. Thought about adding speckles but resisted. Sat back and left it alone. you're a brave soul to ink over those letters with Pico - i'd mess it up for sure!! i use my MISTI and HA black ink - stamp twice and emboss with clear and i get a great shiny finish. anyway - wonderful card - really like the design. is that a pink envelope or the base of you card - i can't tell??? whatever it looks great. Clean and simple and gorgeous. I agree with Betty, I would have made a mess with the Pico thingie but you did a great job. YAY! Love the look of the Pico IrRESISTible Embellisher! Love this fun card. You are having fun with your embellisher. My New Year's Resolution is to not buy any stamping related items for a whole year!! My son is holding me to my word or I am afraid I would slip up. I'm sure it will be around next year as it sounds wonderful. Such a fabulous design Joan! Very nice card. 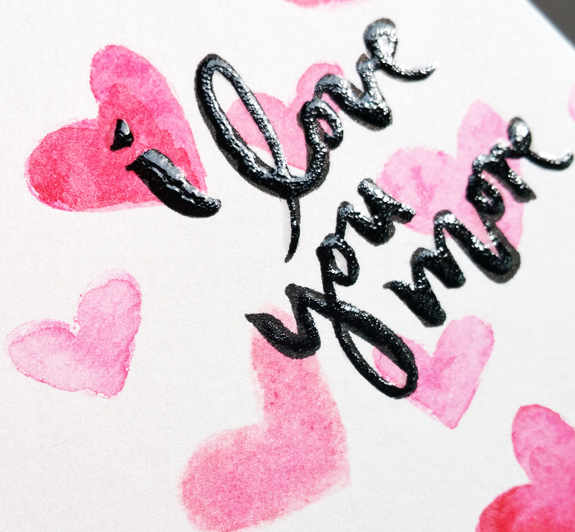 I need that Love You More sentiment for my cards. Totally fabulous! And that bunch of butterflies card is fabulous, too! Oh, Joan, I LOVE this! Perfect! Pico Embellisher again and it looks great. Got to get that tip out and try it.